Dandelion, won't you tell me what to do? "Dandelion" is from Charlotte Gainsbourg's album, IRM. Beck cowrote and produced the entire album. The song is a laidback glam blues, not terribly original musically, but a style which I always welcome. The clever and light lyrics feel cinematic, with lots of scenes and characters mixed together. Red River is a common name of rivers and places, so I cannot say what Beck is referring to exactly. However, there is a classic blues song called "Red River Blues," which includes the lines "Red River, Red River, tell me what to do." This is the same thing asked of Dandelion: "Dandelion, won't you tell me what to do?" "Shape I'm in" is also an old blues phrase, in lots of songs. It usually refers to the miserable, desperate mindset. Ironsides was an old legendary wooden war ship from the 1700s, that never lost a battle. That's not what Beck is referring to here, as he mentions a railroad and it rusting. So he's just borrowing the image and name, of something solid and strong breaking down. The next verse, I love. "I'd make a wish but I don't think it'll ever come true" is a great expression of hopelessness. Finally, Belle Starr was a famous outlaw in the mid-1800s. She robbed stagecoaches and stole horses and things. Bob Dylan references her in "Tombstone Blues," while also singing "Mama's in the factory / she ain't got not shoes." Anyway, all of Beck's blues scenes end up directed at the Dandelion, which does bring the song more to life. Without those lines, the song would likely feel overly fantastic, a series of old-time images with little connection. 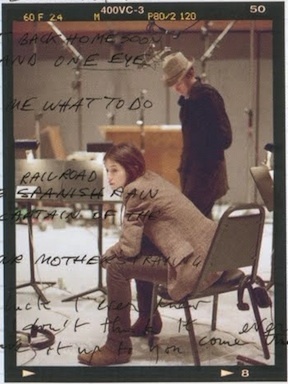 In the liner notes of IRM, there are handwritten lyrics, which include some lines that were changed. The first verse originally was "I'll take it slow" instead of "I'll take my time." Also later, it was "Ironsides rusting in the Spanish rain" instead of "railroad rain." Also, from the change in handwriting, it appears the "dumb luck" verse may have been added at the last minute.